Since our merge with Simmonds Glass in 2015, Island Sash & Door now has a full line of shower and bath enclosures to offer to all our customers, both contractors and individual families. It is an exciting new product line added to our outstanding line of windows and doors! 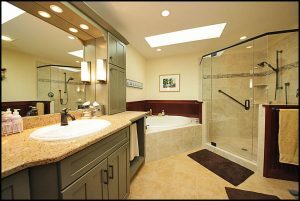 Our suppliers have a variety of shower and tub enclosure configurations, metal colors and glass selections. We have fully framed, semi-framed and frameless options available – all with virtually unlimited configuration options. Glass styles include clear glass, colored glass, patterned glass, heavy glass (up to ½” thick! ), cast glass and translucent laser-etched glass. Of course, corner and neo-angle units are also available along with both sliding doors and double-doors (French door style). 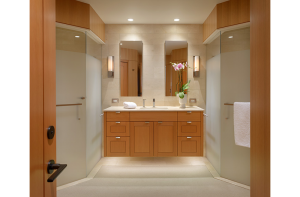 The options continue with bath screens, for those who prefer a more open shower look. Another consideration for ADA compliance is the barrier-free shower with double doors that swing outward and no step up for easy access. Our staff is here to help you explore the options, select your products and order the shower and bath unit of your dreams!